The Compulsive Reader: Giveaway: Win a Beach Bound Prize Pack! Simon and Schuster has released two books this Spring that exude summer feelings and charm, and totally should be included on your summer checklist, whether you hit the local pool, the beach, or just sunbathe in your backyard! They are Moonglass by Jessi Kirby (read my review here) and We'll Always Have Summer by Jenny Han (read my review here)! When Anna was little, she and her mother used to search for sea glass, but since they looked at night, they called it moonglass. Now, ten years after her mother's mysterious death, her father is working as head lifeguard on the same beach where her mother grew up and her parents first met and fell in love. Reluctant to get close to anyone (including her father) and not pleased about having to start at a new school, Anna begins to spend more time alone, running the length of the beach and wondering about who her mother really was. After meeting a lifeguard named Tyler, she slowly lets her guard down and together they start exploring the abandoned houses that dot the beach. But when learning more about her mother's past leads to a painful discovery, Anna must reconcile her desire for solitude with ultimately accepting the love of her family and friends. Moonglass is a dazzling debut from an undeniable talent. 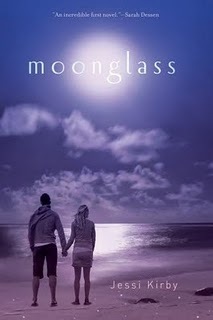 Click here to read more about Moonglass! Jenny Han's bestselling trilogy, which includes The Summer I Turned Pretty and It's Not Summer Without You, concludes with an impossible choice in We'll Always Have Summer. Belly has only ever been in love with two boys, both with the last name Fisher. And after being with Jeremiah for the last two years, she's almost positive he is her soul mate. Almost. Conrad has not gotten over the mistake he made when he let Belly go even as Jeremiah has always known that Belly is the girl for him. So when Belly and Jeremiah decide to make things forever, Conrad realizes that it's now or never--tell Belly he loves her, or lose her for good. Belly will have to confront her feelings for Jeremiah and Conrad and face a truth she has possibly always known: she will have to break one of their hearts. Read more about the Summer books here and check out the trailer below! In order to win, just comment below and share one of your favorite summer or beach reads! I want to know! The contest will be closed on May 20th, 2011. U.S. residents only, please. Happy reading, and enjoy your the warm weather! I love reading lighthearted stories in the summer! My favorite young adult summer read would have to be The Boys Next Door by Jennifer Echols. It's a fun, cute story! I love reading Carpe Diem by Autumn Cornwell and The Queen of Babble by Meg Cabot. Also, any Sarah Dessen novels. Nothing set in winter, though. I like to read fun, happy, summer-y books! I don't have a special summer read. I just grab whatever is next on my TBR pile. There's nothing better than beach reads AT the beach! I really love Sarah Dessen's books and Deb Caletti's too. Also road trip books like Morgan Matson's "Amy and Roger's Epic Detour!" One of my favorite summer reads is Sea Change by Aimee Friedman. I love the setting in the book. Thanks for the giveaway! One of my favorites is Lovestruck Summer by Melissa Walker! Loooveed it! My favorite summer read is Monsoon Summer by Mitali Perkins. Such a vivid and endearing story! I love anything by Sarah Dessen, especially Along for the Ride. Well I would have to say that my favorite summer reads were Twilight, New Moon, and Eclipse. I read those the summer I had my first son. I would spend time out in the backyard on the hammock with my baby in my lap while reading. I couldn't put them down! I laugh out loud every time I read either Hope was Here or Rules of the Road by Joan Bauer. 2 of my favorites! My favorite reads last summer were P.C. Cast's Divine series -Divine by Mistake, Divine by Choice, and Divine by Blood. Great fun books full of fantasy, love and history! This summer I am looking forward to so many good reads - Passion by Lauren Kate and Spellbound by Kelley Armstrong to name a few! My favorite summer reads are Sarah Dessen books. She just captures the possibilies that summer holds so well. My summer read that comes to mind is South of Broad by Pat Conroy. It is probably not a traditional beach read but it takes place in Charleston SC which is one of my favorite places in the world! Since Charleston is on the coast it always makes me think of summer. 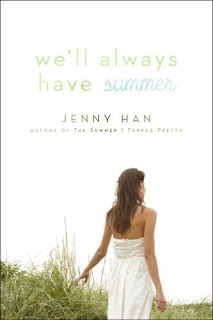 Also, the first 2 books in the Summer series by Jenny Han were so good! I would love to win and get the third one! One of my favorite summer reads is Along for the Ride by Sarah Dessen. Thanks for the giveaway. I love The Boys Next Door by Jennifer Echols - it's now out as Endless Summer. My favorites are Sarah Dessen's (because who doesn't love her books?) and Thirteen Little Blue Envelopes by Maureen Johnson. Or anything by Maureen Johnson honestly. I gotta agree with whomever said Pat Conroy's South of Broad. I read a LOT of summery books last summer, but that one (A) was totally my favorite, and (B) really did remind me of summer, in an odd way. I don't have an exact favorite per se, but if I'm at the beach, I just need a fun, laidback, and hopefully funny read to get my mind relaxing! I love the other books in Jenny Han's trilogy, Along for the Ride by Sarah Dessen...there's nothing like a good summer read at the beach! My favorite summer read is any book by Jennifer Echols! (Particularly The Boys Next Door). Last summer I read "Amy and Roger's Epic Detour" - it was the epitome of a perfect summer read. There was a road trip, a cute guy, and romance, but it wasn't at all corny or cliche. I'd have to say that my favorite beach read would have to be Two Way Street by Laurn Barnholdt because I read it before I went to college so I could kind of relate! One of my favorite beach reads is Twenty Boy Summer. It has love lost and love gained and happiness and tragedy and it's just such a good book. Another favorite is Love Story by Erich Segal. I've read this book a million times and it gets better every time I read it. Romance books are my favorite. My favorite summer read was along for the ride by sarah dessen. I had bought it right before going on vacation with my friends and had just brought it with me on a whim if we had any down time if the weather waddle so great. Well I brought it to the beach with me the third day. After eating I took the book out of my new beach bag and started to read it figuring I'd get through a chapter maybe cause the ocean was calling my name. Well as it was I could not put this book down it has everything a good summer read needs; boys beach drama and friendship! Being a girl who deals with insomnia myself I just loved this book. Well I didn't get back in the water that day and instead was with my toes inthe sand and my nose in the book. And i loved it.! I always thought the Au Pairs books by Melissa de la Cruz were great beach reads. Plus the first two Summer books were great beach reads. I had a lot of fun with The Boys Next Door by Jennifer Echols. Made me wish it was summer on the lake. My favorite summer read would by Perfect Chemistry. I love Twenty Boy Summer, even though it isn't a happy beach read. It's way less frivolous than the name sounds - just read the back cover! I love reading fantasy and YA romantic books. I enjoy both immensley reading them during the summers. They aren't exactly summer reads but I always reading any Sarah Dessen book during the summer. They're aren't too deep and pull me in just right every time.